The NSR-1514C Rechargeable LED Area Light Kit is perfect when portability is important. This area light cranks out an impressive 1,000 lumens of light on high and 500 lumens on low using a single sealed push button switch. The housing is constructed from lightweight 6061-T6 aluminum and the multi-fin heat sink design keeps the fixture cool to the touch. The light can be swiveled independently allowing the user to position the fixture exactly wherever light is needed and the heavy-duty magnetic base allows the light to be attached to most metal surfaces for hands-free operation. 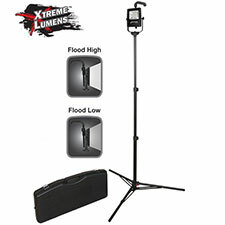 The area light kit includes an adjustable handle, a 6 tripod with camlock adjusters, and AC and DC power supplies all placed inside a durable carrying case.